This is one of those weeks that I will be sharing a couple of recipes from our Sunday dinner. I do this for two reasons-- 1. It is peach and corn season and 2. I have made both recipes three times in the past month (yeah, that good). I was inspired to create this recipe after making the strawberry caprese salad and reading an article in Fine Cooking. Since I am a big fan of the sweet and savory combination, I wanted to highlight another favorite summer fruit in a similar manner with a few changes. Instead of using freshly sliced peaches, I caramelize peach quarters in a cast iron skillet with a bit of butter and sugar. Once each side becomes sweet, browned and sticky, I cut each quarter in half. Cooking them in larger pieces keeps the slices from cooking all the way through so you don't wind up with a mushy, over cooked slice. It is also important to use ripe, but firm peaches for this recipe. 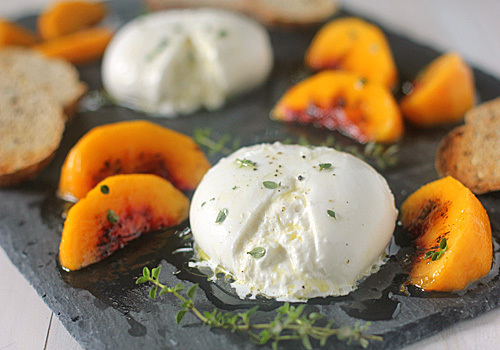 If you are not familiar with Burrata, it is fresh mozzarella that is grated and mixed with heavy cream. The mixture is then wrapped in fresh mozzarella. Slice it open and enter a creamy, cheesy heaven. Once plated, I drizzle the peach slices and the cheese with a lemon, thyme and honey vinaigrette. Serve on some toasted multi-grain bread for an added nutty flavor and I guarantee you will be adding this one to your summer recipe repertoire. In a small bowl, whisk together the olive oil, honey, lemon juice, and thyme leaves. Season to taste with salt and freshly ground black pepper; set aside. Position a rack in the upper portion of the oven and preheat the broiler. Lay the slices of bread on a baking sheet and drizzle with olive oil. Broil until the top is golden brown and toasted, checking often to make sure the bread is toasting evenly. Remove from the oven and set aside. In large cast iron skillet, melt the butter over medium-high heat. Sprinkle the sugar evenly over the pan and lay the peaches cut side down. Cook until the peaches begin to caramelize, about 1-2 minutes. Turn the peaches over to the other cut side and cook until caramelized, another 1-2 minutes. Transfer the peaches to a cutting board and slice each quarter in half. Place the cheese on a serving platter surrounded by the caramelized peaches and toasted bread. Drizzle the peaches and cheese with the vinaigrette. Season the cheese and the peaches with a sprinkle of kosher salt. Spread the cheese on the bread and top with a slice of peach. Enjoy! This is beautiful and looks FANTASTIC Nicole! I think I love you :) This looks positively sinful. Thanks for sharing and for the inspiration!! Our appetizer for tomorrow's Sunday dinner! Beautiful peaches! I saw your photo on TasteSpotting.com and clicked over to your site. This is beautiful and inspiring.